Your tears comfort your eyes in many ways. Water moisturizes, an outer layer of oils lubricates and prevents evaporation, and proteins help protect against infection. Dry eye strikes when your eyes can’t produce enough tears for lubrication or the moisture in your tears evaporates too quickly. Dry Eye is a very common condition which we treat in our practice. Some recent research by Harris Interactive indicates that about 70% of people with dry eye don’t ever see an eye care professional. That is somewhat disturbing because a lot of patients could be helped by dry eye treatments. There are a number of treatments out there, and you can read about them here. In the Harris Interactive study, mentioned above, the researchers found that nearly half of all Americans experience one or more dry eye symptoms regularly. That’s pretty amazing. What Does the Dry Eye Exam Consist? When we see patients who suspect they have dry eye syndrome we begin by having them fill out a history form. During the exam, we ask about their dry eye symptoms and other questions that give us insight into the potential causes and find out what – if any – self-management has been done up until now to try to treat dry eye. There’s also a discussion kit developed by Allergan. They actually have a great website called My Dry Eyes that presents plenty of information about dry eyes and goes over things you could discuss with your doctor when you go in for an exam, and you can write to them for a kit with suggestions and tips. We do a very thorough examination. We spend a lot of time evaluating the tear film, looking at the different layers of the tear film. We measure the quantity and evaluate the quality of the tears produced by the eye, paying particular attention the oil produced in the tear film. Ultimately, we diagnose what type of dry eye you have; whether it’s evaporative, or mucus deficient or water deficient. Then we develop a treatment plan based on different methods that we use to treat different types of dry eyes and work together to implement that plan. If you have any questions, email dral@nynjoptometrist.com, call our eye care office, book an appointment online or visit our Midtown Manhattan dry eye doctor today. It used to be thought that dry eye was more prevalent in women, but now we find men suffer from dry eye nearly as often. Fifty-two percent of women find they experience dry eyes on a regular basis while 43% of men are affected by more than one dry eye symptom.It’s been known that contact lens wearers are more prone to dry eye syndrome. Those who wear contacts are almost 10 times as likely to experience dry eyes as those with perfect vision, and more than 5 times as likely as those that wear glasses. Nearly 1/5 or 20% report using over the counter eye drops to treat symptoms at least 5 times a week. The majority of those who use drops to manage dry eye symptoms said that they are only somewhat successful. Almost 59 percent of adults said that they have not been to a professional for help managing dry eyes. Why is Dry Eye so Prevalent Today? Dry eye syndrome seems to have become more common in recent years. Perhaps with the advent of technology iPhones and other mobile devices, more people are squinting down at small print. More people than ever before are spending more time in front of computer screens, or involved in other activities that promote staring. When you stare, you blink less frequently, and this contributes to dry eyes. Contact lenses are great for correcting vision and are becoming more popular even for young patients. However, wearing contact lenses can cause dry eye, especially if they are worn for too long or if you don’t take care of them properly. Some brands are better than others, and wearing glasses seems to decrease the risk of dry eyes even more. Furthermore, the general population is ageing, and the chances of developing dry eye symptoms increase with age.Using medication is another one of the many things that could cause and contribute to dry eyes. There are numerous causes and risk factors that contribute to the development of dry eye syndrome. When you stare at something you tend not to blink as frequently, and the lack of blinking actually causes the eyes not to replenish the tears often.The main component of tears is water. Most of us don’t drink enough water. If you are dehydrated or not drinking enough, then you may not produce enough tears to keep your eyes moist. Snapple, Coke and other caffeinated drinks like coffee and tea may feel like they quench your thirst, but they actually dehydrate the body. Your body needs water to prevent dry eyes symptoms. Speaking of which, certain medications are known to contribute to dry eyes; in particular, allergy medication. Especially pervasive at this time of year, the use of Claritin or other antihistamines to control eye allergies or systemic allergies, will often lead dry eye symptoms.Another widespread type of medication that can certainly cause dry eye symptom is beta blockers used for blood pressure.Women that are on antigen therapy are likely notice symptoms of dry eyes. They tend to have a lot more irritation. Here is a recent interesting study about the correlation between migraines and dry eyes. Looking at migraine sufferers compared to people without headaches. The results showed greater prevalence of dry eye in the migraine group than in those without headaches. So, researchers are speculating that some migraines may worsen when dry eye symptoms are present. Another study I read recently looked specifically at office work and hypothesized that headaches that people complain of are really being caused by dry eyes. However, it is unclear whether one causes the other, or whether computer use is a contributing cause of both headaches and dry eyes. Another very common cause of dry eyes that we are seeing more and more is something called blepharitis. Blepharitis is inflammation of the lid glands that allow and produce the oil in the tear film. Over time, those glands that line the lids can get clogged and the oils in your tear film don’t flow on top of the tear film to protect it. People suffering from blepharitis are producing tears, but they’re evaporating too quickly. So in between blinks, the tear film is just drying up or breaking down. That causes redness and other symptoms and classic signs of dry eye. We call that evaporative dry eye. Some suggest that many years of staring at a computer screen increase the prevalence of chronic blepharitis. Hormonal changes can cause dry eyes; women especially over 50, and men as they age in general are more prone to developing dry eye symptoms. Environmental conditions can also play a role in dry eye syndrome. Exposure to cigarette smoke, dry air and pollen are also common dry eye causes. Rheumatoid arthritis, and Sjogren’s syndrome, which is a common symptom that rheumatologists treat, can also contribute to dry eyes. Diabetics or those with Glaucoma that requires medication are more likely to have dry eye syndrome. One of the main reasons people discontinue contact lens usage is due to dry eyes. The good news is there have been major improvements across all the brands with special contacts that are aimed at preventing dry eye symptoms. What Treatments for Dry Eye Are Recommended? There are many ways to treat dry eye. The first recommendation is to prevent dry eye symptoms. Blink a lot and drink a lot. Avoid eye irritants, use lubricating eye drops if you are taking medication that puts you at risk for dry eye. Over the counter eye drops for dry eye are widely available. Maintain a healthy lifestyle with a focus on vitamins like Omega 3. During heavy computer use, every 20 minutes, look down or close your eyes for a few minutes, to give your eyes a rest. Drink water. Regular, bottled water is best. Avoid caffeine. Women need at least 91 oz. of water a day. Men need even more. Vitamins, particularly Omega 3, have been shown to decrease dry eyes. Fish and flax are good natural sources of Omega 3 fatty acids. Omega 3 is also available in tablet form. If using a medicine that is known to contribute to dry eyes, like antihistamines or beta blockers, it’s important to combat dry eye with over the counter teardrops. Omega 3 vitamins are very well-known to be good for general health, and heart health, but they are also helpful in treating dry eyes. We recommend at least 3 grams a day of Omega 3. There are a number of commercially available products. The one we carry in the office, made by EyeScience works very well, but certainly, any of the Omega 3’s that are available are helpful in reducing the symptoms of dry eyes.The multi-vitamin we recommend here is called Dry Eye Formula. It contains Omega 3 with DHA from flaxseed oil and includes vitamin C, vitamin E, Vitamin B6, magnesium, and a variety of other vitamins specifically geared toward patients with dry eyes. Each tablet contains 1 gram of Omega 3, so you take 3 a day. I take it myself after my biggest meal of the day, but some people with sensitive stomachs find they are more comfortable taking 1 tablet after each meal. You can read more about it on our website and there’s a link that makes it easy to order it right from us online. One of the most common dry eye treatments we prescribe is Restasis®. Rerstasis® is an eye drop that is used twice a day. It’s the teardrop form of cyclosporine, a medication that is prescribed for many chronic conditions, and it has been found to alleviate the symptoms of dry eyes as well. The downside of Restasis® is that, when you first start taking it, it causes some burning of the eye in some patients, and it does take up to 3-6 months to really work its way into the body. So, often when we prescribe Restasis®, we also prescribe a steroid to reduce inflammation and avoid the initial side effects of burning and itching eyes.Restasis® seems to improve the quantity of the watery part of your tears, but it doesn’t necessarily help to improve the outflow of the oil that needs to be produced on top of the tears so that the tears don’t evaporate. Right now some of the studies are suggesting that over 50% of people with dry eyes actually have meibomian gland dysfunction. So, if the first lines of treatment are failing to manage dry eye symptoms, consider more rigorous treatments for dry eyes and blepharitis. There are some treatments aimed at treating blepharitis. One of the more common methods we recommend in the office is using a warm compress with massage. Really, a hot compress should be used multiple times a day for the most effective dry eye relief. TranquilEyes makes goggles fitted with gel packs to make the hot, moist eye treatment more convenient. That will loosen the blockages in the oil-producing glands and help reduce the symptoms. However, that process requires consistency and effort, and it doesn’t get to the root of the problem.There is a medication we often prescribe in the office called AzaSite®. It’s Azithromycin in eye drop form. AzaSite® is used twice a day for two days and then once a day for the remainder of the month. That prescription dry eye treatment seems to be pretty effective, but, like hot compresses, the dry eye treatment is dependent upon patient compliance. The FDA recently approved of a new device called LipiFlow. It has just become available and we are proud to be one of the few practices in NYC with this cutting-edge technology. The procedure to attach the device to the eyelid is done in the office. LipiFlow actually purges the eye from all the clogged oils by heating up the glands so that the oils become unclogged. During the first session of our eyecare radio show, Laura from Florida was very satisfied with the LipiFlow procedure we recommended. She highly recommended it, saying that LipiFlow is “not uncomfortable at all. It takes about 12 minutes and the results seem to be immediate.” Laura, who had suffered from unmanageable dry eye syndrome for many years, noted that, while “many doctors have never heard of it,” LipiFlow has been “a miracle.” For more information on Lipiflow at our Manhattan practice visit our Lipiflow page. The most advanced technology for the treatment of Dry Eyes. The only FDA cleared medical device for Meibomian Gland Dysfunction (MGD) shown to improve gland function for the 86% of Dry Eye sufferers with MGD. Our commitment to providing the most advanced care for Dry Eyes in Midtown Manhattan is strengthened with the Lipiflow By Tear Science/Johnson & Johnson Vision. Do You Live in Downtown Manhattan and suffer From Dry Eyes? Doctor Alan B. Schlussel is the founding director of the Dry Eye Treatment Center of New York and New Jersey. Dr Alan Schlussel, Founder and Director of the Dry Eye Center in Midtown Manhattan. 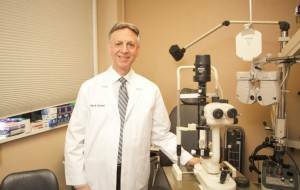 Doctor Schlussel, a 1984 graduate of the State University of New York College of Optometry has dedicated his career to diagnosing and treating eye care diseases including dry eyes. When Dr Schlussel experienced first hand the deleterious effects of Dry Eyes, he began to develop a strong interest in helping people who are suffering from what he experienced. Dr Schlussel is unique in the Manhattan area in that he is one of the few Eye Doctors who devote a significant portion of their time on Dry Eye treatment. The Dry Eye Center with Dr Schlussel at the helm seeks to utilize the very latest technology to alleviate and treat the symptoms of Dry Eyes. A common medication that is prescribed is Restasis eye drops, which when administered by an Optometrist that has ascertained the cause of your Dry Eyes can alleviate much of the discomfort. The Manhattan office of Dr Schlussel and Dr Law has seen a large increase over the past few years in contact lens wearers who suffer from Dry Eyes. One of the reasons for the increase in Dry Eyes symptoms is the increase in screen time on computers, cell phones, and TV, which causes excessive drying of the eye. Due to the extensive experience of our eye doctors with many speciality contact lens products, our eye doctors have had considerable success in treating contact lens-related dry eye. As your eye care professional, Dr Schlussel coordinates treatment with you and stays behind what you’re doing. Dr Schlussel will spend as much time as you need and he is very understanding of dry eyes because he has it himself. Dr Schlussel has been treating his own dry eyes for six years. His patients have been coming in with numerous complaints about dry eyes, and he helps a lot them. Learn about all the newest and most advanced treatments for Dry Eye in NYC. Lipiflow is a revolutionary treatment that cleans out the clogged oil glands by gently heating and extracting the clogged oil that is the cause of the inflammation. Lipiflow is considered the "Gold Standard" of Dry Eye treatment. One of the leading causes of dry eyes is Meibomian Gland Dysfunction (MGD), which describes a condition in which tiny glands in your eyelids are blocked. Your eyes deserve some special treatment too! The Dry Eye Center at our Midtown NYC practice offers a relaxing dry eye spa treatment to get your eyes feeling rejuvenated. Our state of the art dry eyes treatment center in Midtown Manhattan is proud to offer Blephex, a revolutionary product that helps prevent and treat dry eyes associated with clogged oil glands. The Dry Eye Relief Mask (D.E.R.M.) is a heat mask designed to relieve the symptoms of dry eyes by loosening up the blocked glands. Doctor Alan B. Schlussel is the founding director of The Dry Eye Treatment Center of New York and New Jersey. Learn more about our speciality dry eye care.